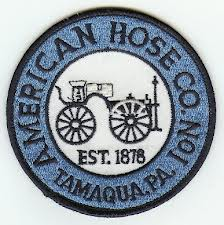 08/17 1936: Tamaqua Fire Department for Ladder 770, Citizens, East End for an engine, automatic response mutual aid to Hometown for a commercial fire, Silberline Manufacturing. AHCO with a crew on L770 responding, Citizens E782 responding followed by E778 from East End. Update from county, aluminum fire, C27-03 on scene. C25-01 on scene, requesting Hometown tanker 25-30 to come in, all other units to stage on Progress for assignment. L770 positioned at Gate 1 while Citizens moved up to hydrant near gate 3. East end hooked up to hydrant near gate 1. L770 moved up to building to ladder the roof. E26-10 to stand-by on Tide Road to cover any other calls. Fire contained to equipment, but remaining very hot. Most units remained on scene till about 2100 hours, East End released along with Ryan E26-10. By 2130, equipment temperature still falling and within safe zone. All remaining units released. T25-30 remained on scene. Thank You, from the Block Party Committee!! !